The Commissioners of Irish Lights have chosen this auspicious day to formally shut down the last fog signals around our coastline. CIL says the decision to turn off the fog horns was because of “rapid advances in marine navigation technology” and the fact fog horns are “not an aid to navigation”. In other words, every mariner needs to have a working GPS receiver and a chartplotter. I beg to differ. Over the years, sailing small boats (too small to have GPS) in Dublin Bay, the East Pier fog horn has been the only way to find home when fog rolls in over the bay. And, when it’s snowing, we could hear the East Pier fog horn all the way to Terenure. Notice to Mariners from CIL, 10 September 2010. This jack-up barge Excalibur has been spending the past month drilling 23 boreholes in the Bay on behalf of the Ringsend Waste Water Treatment programme, and has been quite visible from the shore. Dublin City Council is undertaking an Environmental Impact Assessment (EIA) into expanding the wastewater treatment works at Ringsend to its ultimate capacity, in line with a recommendation in the Greater Dublin Strategic Drainage Study, 2005. This will involve the construction of an alternative discharge point approximately 10 kilometres offshore due east of Dublin, which will meet with all EU and Irish discharge standards from the existing Works and from the proposed extension. “This is the emerging preferred option in terms of less energy consumption, less chemical use, less sludge production and lower carbon footprint and also because the Ringsend Wastewater Treatment Works has limited capacity for expansion, due to space restrictions at the site. There is no ability to expand the Wastewater Treatment works boundaries”, says Pat Cronin, Executive Manager, Dublin City Council. “We are about to carry out a Site Investigations Contract to see if it is feasible to construct an alternative discharge point offshore. 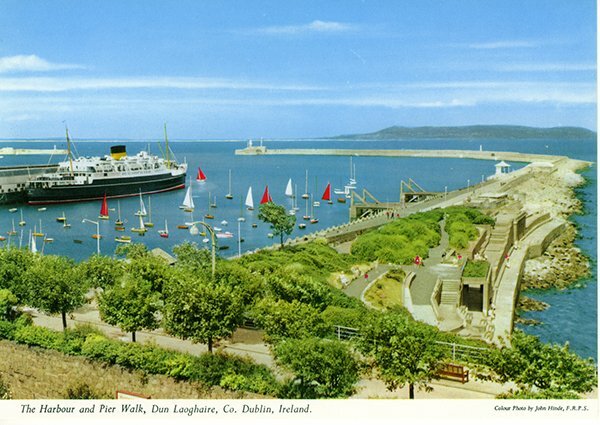 This option would ensure that the wastewater arriving at Ringsend will continue to receive a high level of treatment.” Full Dublin City Council press release from May 2010 is here. 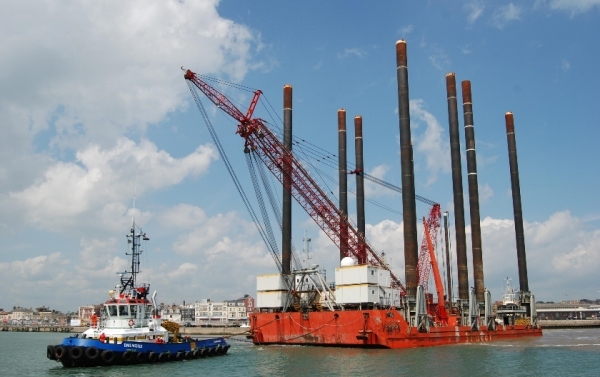 The drilling rig is contracted from Fugro Seacore, specialists in undersea drilling. Notice to Mariners details the drilling locations. Results from the boreholes will provide data on the location of the undersea discharge pipeline to sea, east of the Burford Bank. Visit Marine Traffic to see where the barge is today. Distinctive shape, plywood, for about five seconds I thought: “Sure, I can fix this up, an auld woody, a nice project for the Spring.” Then common sense took hold. 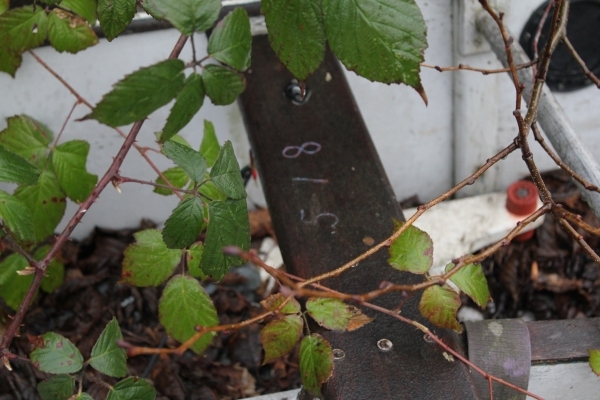 Hull Number 518 makes it really old. At some stage in the early to mid Seventies it was somebody’s pride and joy. A check at Fireball International shows the design was launched by Peter Milne in 1962 and the first World Championships was held at Hayling Island, UK in 1966 and won by Bob Fisher (yes, the acclaimed yachting journalist) and Peter Beale with hull number 1599. Therefore, 518 was built well before that year. 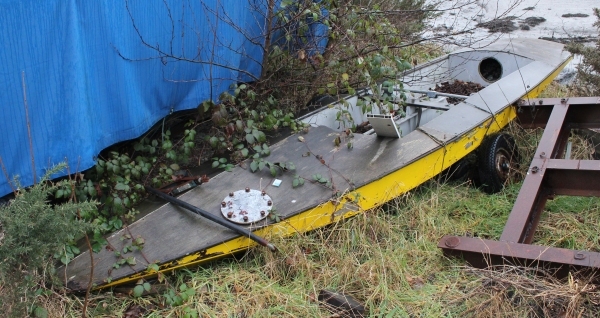 Current new boat numbers are somewhere around 15200. …at 13.30 today. This is becoming seriously boring. Here is the snowboat, up on the roof. 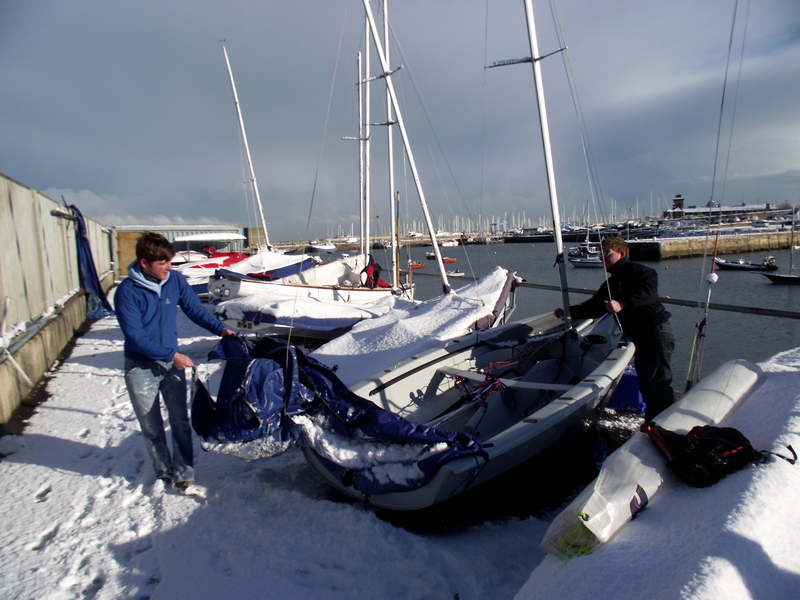 Nobody can recall this amount of snow in the Dun Laoghaire waterfront. Yesterday’s frostbite race was sailed in minus 2 degrees C.
Here is Louise at the Royal St George ready to rig her Fireball once the club’s cat has had a good tickle. Over at the DMYC, the Ryan brothers dig out their RS 200. 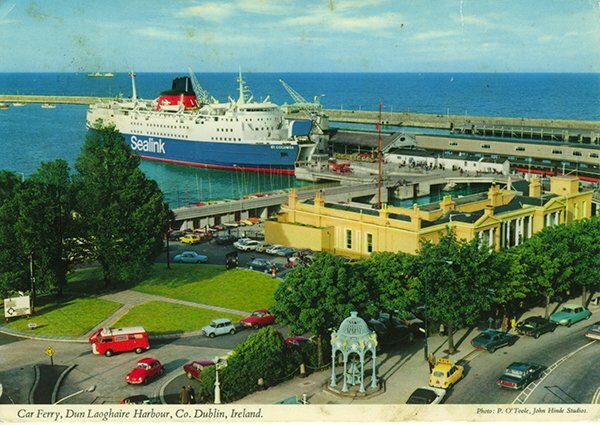 A few images of the Harbour long ago, from the John Hinde postcard collection. Looking down on the George and the Carlisle Pier. Note the link road connecting Carlisle Pier and St Michaels Pier (away to the left out of picture). 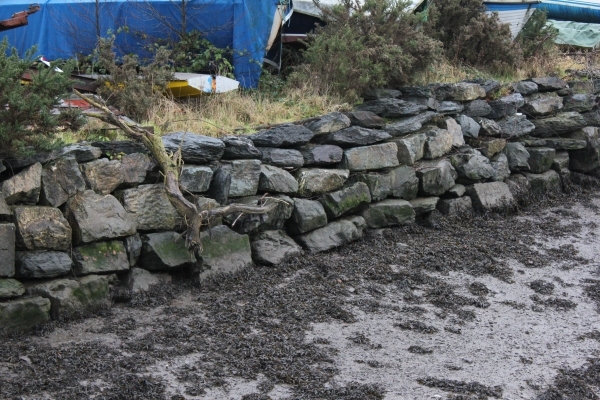 The link road cut off the George from the bay except for a low passage for dinghies to reach the slip. 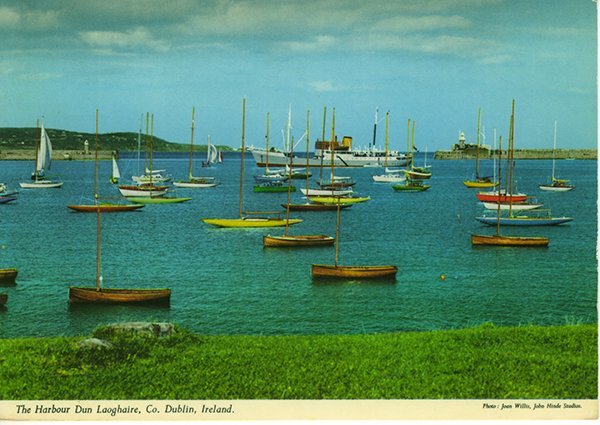 Moorings for Mermaids, Dublin Bay 24’s and others. 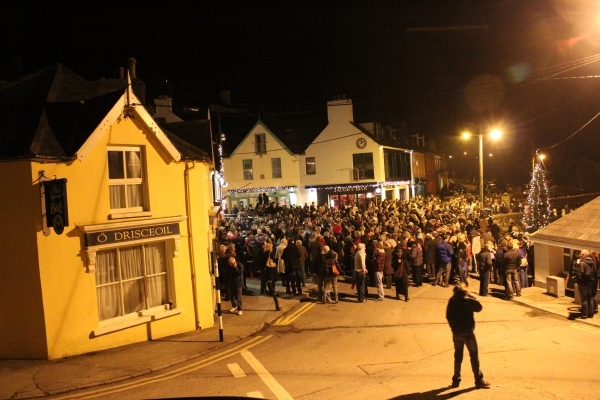 The Royal Irish is to the right of the picture, the Irish Lights compound to the left. I think that is the Irish Lights vessel “Isolde” in the Harbour beyond the moorings. 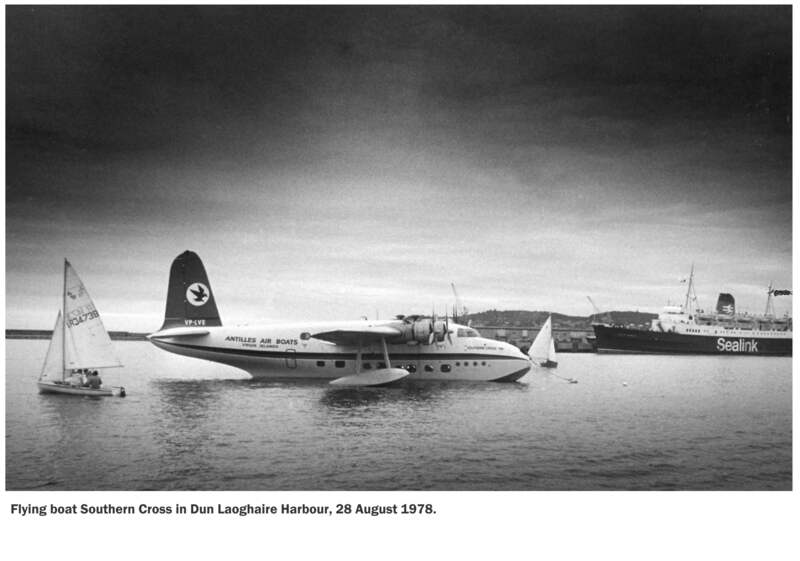 The ship was sold to the Irish Navy in 1976, thus the picture is earlier than that. This card looks over the east side of the Carlisle. 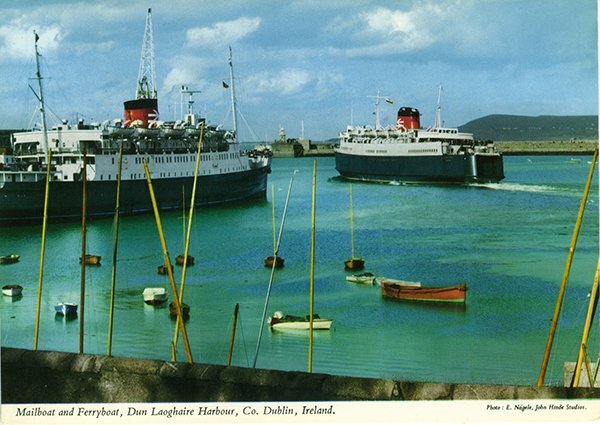 Hinde was famous for “jazzing up” his post cards by adding the colour red as a stand out. I doubt there were that many red sails at the time. This I think is looking out over the National’s boat yard, the building is to the left out of picture. One ferry is alongside the east side of the Carlisle Pier, the other is departing from the alongside berth on the East Pier. I hate this time of year, sailing’s end. The SB3 has been parked for the winter in a dry barn in Cloghjordan. We brought all the sails, lines and loose items home with us after the Dromineer Midlands. Everything has been washed, rinsed, dried and stored in the attic. 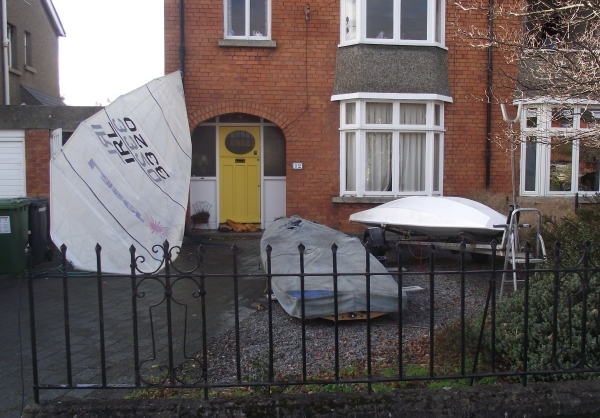 The picture shows the last of the sails hanging out in the drive after being rinsed with fresh water. The head is tied to the railing and the clew is hoisted up the drain pipe. When dried, it was rolled and stored. 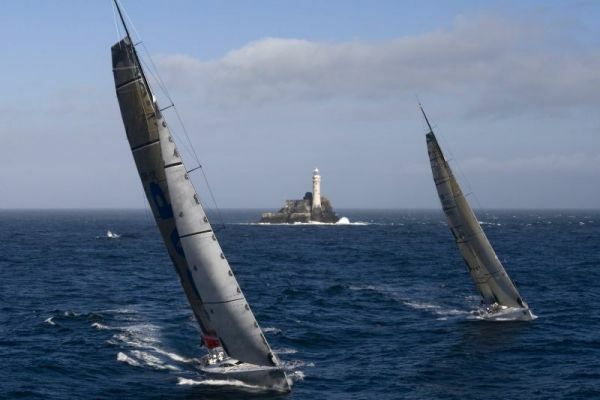 The two Fireballs are being repaired / maintained for the Dun Laoghaire Frostbite which begins on Sunday 7 November. I’ll be out there with them laying marks and doing rescue duty. Haven’t had one as good as this in a while, nobody injured. 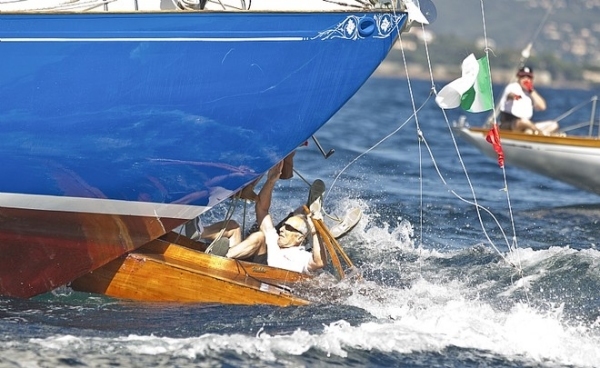 Marjatta on the left, owned by Guido Broggi (ITA) and Harlekin with owner Jean Yves Redor (FRA) on the helm during race two of the Les Voiles de Saint-Tropez regatta on Wednesday. 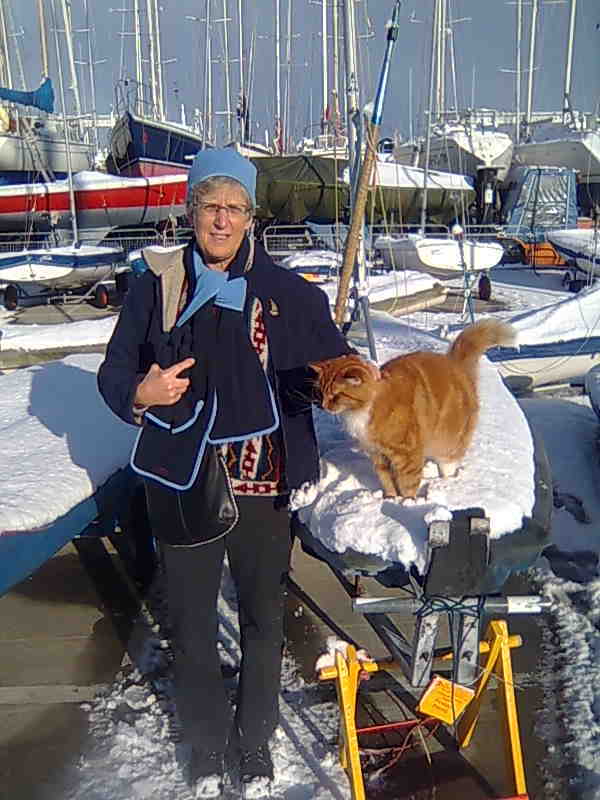 Harlekin lost her mast, Marjatta was DSQed. Three of Harlekin’s crew went overboard and were promptly picked up by spectator boats. 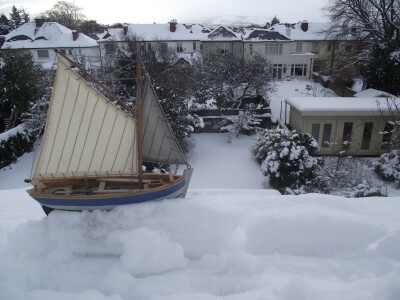 Harlekin is a Scandinavian 30 Square Meter sloop, built in 1948. More here. Marjatta is a Marconi Yawl, built in 1943 in Finland, LOA = 18m More here. 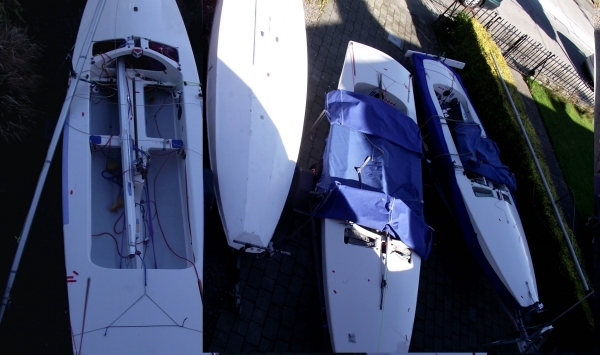 These four Guy Winder-built Fireball dinghies are in for repair after the end of the summer season. Need to be ready for winter Frostbite in Dun Laoghaire. 14416: very bad gelcoat de-lamination on the hull, nicks on centreboard trailing edge. 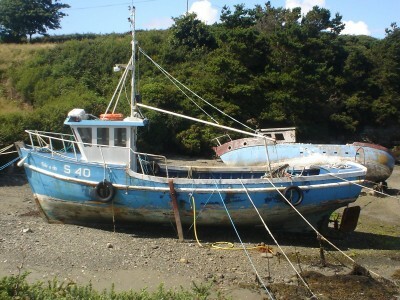 My friend Leo purchased a rather down at heel wooden fishing boat and is busy converting it to a sailing ketch. A tall order. Leo is a very talented carpenter and has been busy for the past year working on Sile at Hegarty’s Yard in Oldcourt, near Baltimore. After the boat was dragged ashore, he removed the ancient engine, the cabin, fore bulwarks and decking, built a tent around the craft and set to work extending the stern. Visit his blog, long on pictures and short on words, and be amazed.